We’ve been away from the blog for a while, so I’m here to fill you in on what we were up to last month. 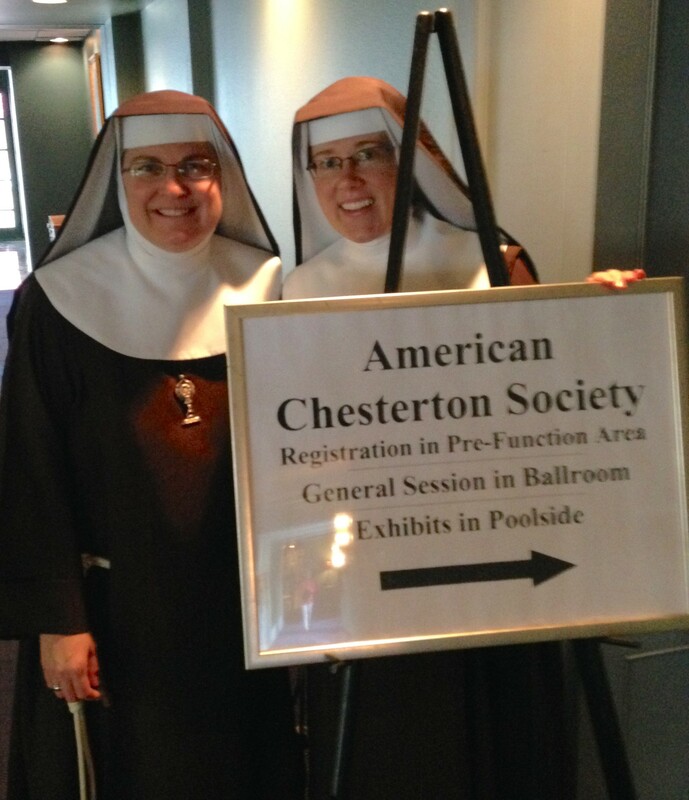 August began with a dream come true – the American Chesterton Society held it’s 34th annual conference right here in San Antonio! Being long-time readers of Gilbert Magazine and fans of GK Chesterton, we were thrilled at this opportunity to attend the conference right in our own backyard. On August 5th Dale Ahlquist arrived in SA to set up for the conference. This provided a chance for us to have him in studio with us on A Good Habit Episodes. Back in 2013 Dale was our very first guest on the show, joining us via phone from his home in Minnesota, and we were eager to have him on again. Dale is always gracious, funny and a great fit for our show since we talk about “anything and everything” – which also describes all the different topics and ideas about which Chesterton wrote. After the show we drove Dale to his hotel, and he very kindly invited us to join him and some of the other ACS members for a late lunch. So we found ourselves at the restaurant of the historic Menger Hotel right across from the Alamo. We have often passed by this San Antonio landmark, but have never been inside. As was often mentioned during the conference, the hotel bar was the site where Teddy Roosevelt recruited the Rough Riders, and where Oscar Wilde likely had lunch while in San Antonio. It can now add “Site of the 34th Annual American Chesterton Conference” to its list of notable achievements. The Menger is also said to be haunted, something they are very proud of. 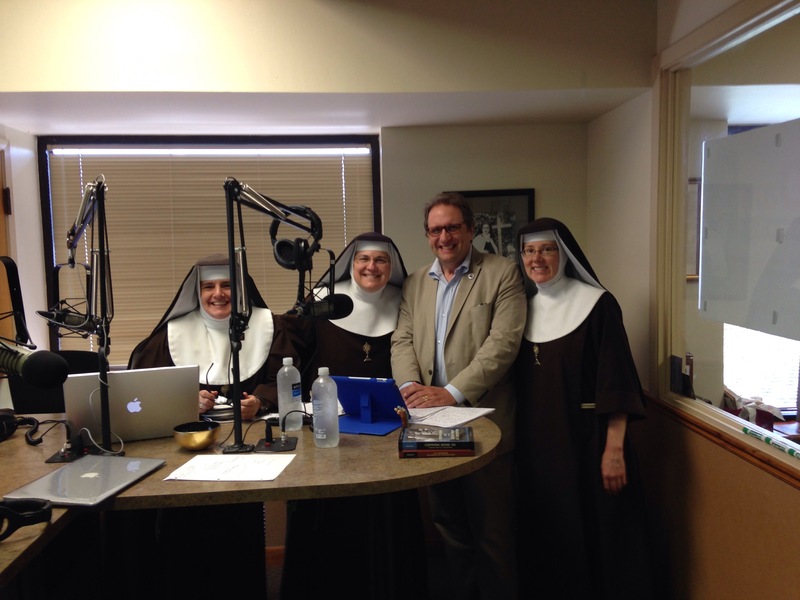 We didn’t see any ghosts, but we did encounter Nancy Carpentier Brown, whose book on Frances Chesterton, The Woman Who Was Chesterton, is soon-to-be released. 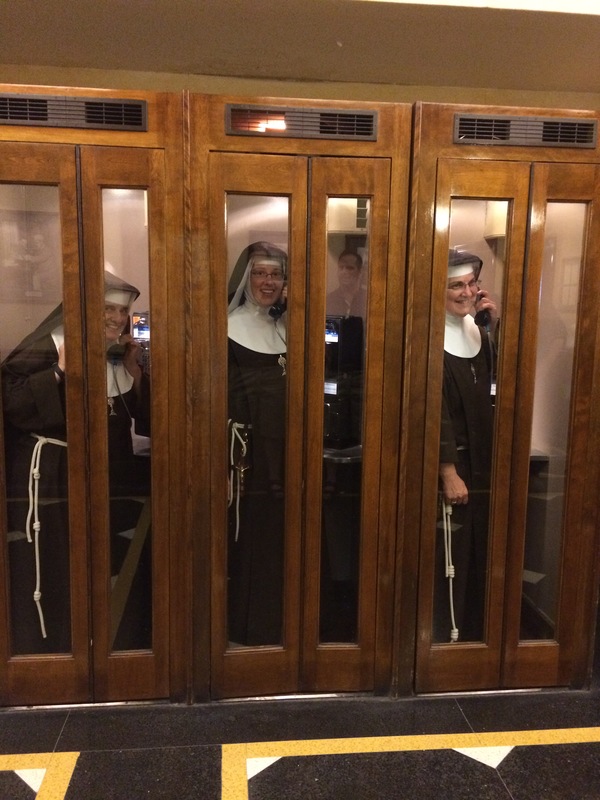 She also took this picture of us having fun in the old phone booths by the lobby. It felt a little surreal to meet people you’ve known for years, though only through the pages of a magazine. We were introduced to Richard Aleman (President of the Society for Distributism and contributing editor for Gilbert Magazine), Kevin O’Brien (one of the conference speakers, he also writes for St. Austin Review and spends most of his time on stage with his Theater of the Word, Inc), Julian Ahlquist (Dale’s son, who apparently spoke at one conference on the topic of Chesterton and Aliens! ), and Mairin and Rose, two lovely young ladies from the ACS office. When dining with Chestertonians there are two things you can expect: good food and good conversation. Well, maybe a third thing you can expect is fermented beverages. As for the good conversation, Richard Aleman’s end of the table covered the topic of distributism – always worth talking about, since it is so little understood. At the other end of the table Dale and Kevin O’Brien covered other topics – I’m not quite sure what they were, actually, since I ended up in the distributist conversation. All I know is that there was a lot of laughter and loud conversation coming from their end of the table. The next evening the conference began with a welcome talk by Dale. We just love listening to Dale talk about Chesterton; he’s completely imbued with his thought, which is only natural since he’s been marinating in Chesterton for many, many years. One thing he talked about which really struck me was that GKC’s greatest accomplishment was that he remained GKC; he became the person God created him to be. Freedom, he said, is the ability of a thing to be itself. And in that sense Chesterton was truly free, and filled with a spirit of gratitude and wonder. For myself, I really did feel Chesterton’s presence throughout the conference, and I had a sense that I was receiving a lot of graces through his intercession. Though he’s not a canonized saint (not yet, anyway) I have long counted him among my saint friends, and I dare say he is my favorite (after Our Lady, of course). Since the conference, I have been asking for his help that I might develop a truly grateful heart and a child-like sense of wonder. The whole idea of gratitude hits home with us because our religious order is dedicated to Eucharistic Adoration in a spirit of thanksgiving, so thankfulness and gratitude are quite central to our spirit as Franciscan adorers. Gratitude leaves little room in our heart for resentment, always something with which I always need help. Another remarkable thing about Chesterton was that he truly loved his enemies; in fact, he didn’t consider them enemies at all. He had a real gift for argument and debate, all in charity, without ever losing sight of the dignity of his opponent. Chesterton was a truly amazing man whose virtues I hope to acquire one day. One thing which struck me was the number of young people in attendance. It’s a good r eminder that truth has universal appeal, and there are still plenty of young men and women whose ears are more attuned to truth than to the noise and distractions of the world. It was unusual, and so refreshing, to see people sitting around talking or reading books (real live books, not Kindles or iPhones) during the breaks. The conference ended with Mass at nearby St. Joseph’s Catholic Church. This little jewel is surrounded on three sides by Rivercenter Mall, so you could almost miss it if you weren’t looking. The Germans built this beautiful little church over a hundred years ago, and even though Joske’s Department Store tried to buy it and tear it down in 1945, the Church is very much alive, and Joske’s is no more. The Blessed Sacrament Fathers have been caring for the parish since 1982, and this is one reason we love going there whenever we have the chance; we always feel at home wherever the Blessed Sacrament is loved and adored. Monday through Friday they have Eucharistic Adoration and confession in the morning – what more can you ask for? It was very moving to end the conference worshiping God in a beautiful Church, all of us together. Fr. Spencer Howe, a young priest from Minnesota who also spoke at the conference, gave a very beautiful homily about spiritual childhood, which was one of Chesterton’s most notable virtues. This was the only time all weekend I didn’t take notes, so I’m hoping they include it in the conference talk CDs, or at least publish it in Gilbert Magazine. The whole conference was permeated by a very tangible joy, and a feeling of camaraderie. Out of all the conferences I have been to, this one had a spirit all its own, of laughter, joy, and friendship. Even though it wasn’t a Catholic conference per se, with Chesterton it always does end up there, because he was always oriented toward the Truth, and it lead him into the sacramental embrace of Christ in His Catholic Church. Not all of the attendees were Catholic, but I dare say they will likely all end up Catholics one day. Tomorrow I’ll talk about some of our favorite conference talks. This entry was posted in Uncategorized and tagged A Good Habit, American Chesterton Society, Chesterton Conference, Dale Ahlquist, Distributism, GK Chesterton, Kevin O'Brien, Menger Hotel, Nancy Carpentier Brown, Richard Aleman, St. Joseph's Catholic Church, Theater of the Word by srelizabeth. Bookmark the permalink.